In the dance studio at St Peters Academy, Fenton Aby teaches Fitsteps; an energetic, upbeat dance fitness class mixing graceful steps of Ballroom and the up-tempo steps of Latin dances designed by Natalie Lowe, Ian Waite (from Strictly Come Dancing) and Olympic swimmer Mark Foster. Fitsteps is a fun heart pumping workout where you dance styles from ‘Strictly Come Dancing’ and ‘Dancing with the Stars’ such as the American Smooth, Cha Cha Cha, Paso Doble and Viennese Waltz. No partner needed. This class is great if you love dancing, want a creative outlet and master new skills. 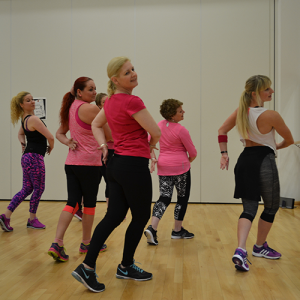 Fitsteps is an enjoyable workout for all ages and fitness levels, this class will keep the brain active and healthy, improve muscle tone & strength, balance and coordination and increase aerobic fitness. Read more about my Fitsteps classes in Stoke-on-Trent. Using the spacious dance studio; sprung floor, temperature controlled and variable lighting. To book a class at St Peters Academy, Stoke-on-Trent simply contact me.